The moniker fits the locale. The Bisbee’s Black and Blue Marlin Tournament, now in its 34th year, was appropriately named. Cabo San Lucas is one of the prime spots in the world where anglers can consistently catch the two largest species of marlin, blues and blacks. There are differences between the two, however, and that calls for different tactics. Blacks tend to hang around reefs and structure with large concentrations of bait. So the underwater mounts off the tip of the Baja peninsula like Gordo Bank and Jaime Bank are prime places to bridle a live skipjack or yellowfin tuna and slowly bump the boat in and out of gear until a marlin spots it and decides to eat. Blues, on the other hand, are open water predators that roam rips, currents and weed lines in search of food like dorado and squid. Boats targeting blue marlin often use lures so they can troll faster to cover more water to maximize the presentation. So far, lures have had the edge in the 2014 Black & Blue. 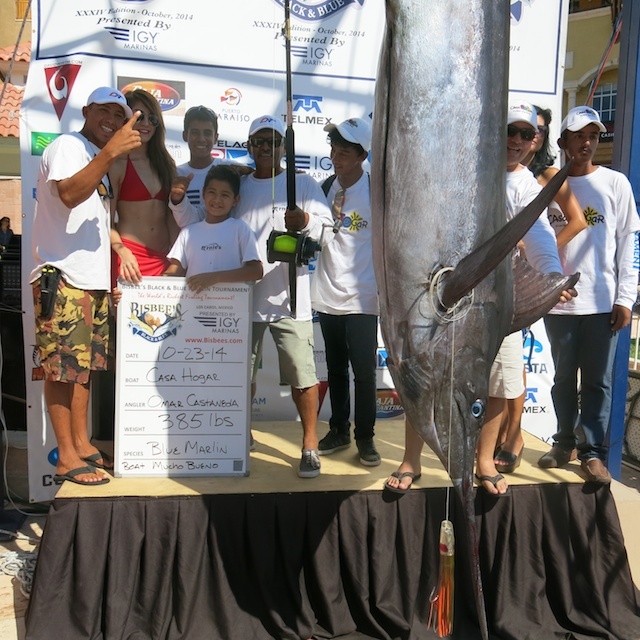 The qualifying fish—all blues—have been fooled by lures, including the one boated today by angler Omar Castenada, competing with Team Casa Hogar, a local orphanage for boys. Capt. Ernie Cossio of Cabo San Lucas is the skipper of Mucho Bueno. “We were at Destladera in the Sea of Cortez using live bait and caught nothing. The water temperature was 83 degrees. We switched and put a Hi-5 Petrolero lure on and three minutes after the lure was in the water we got our bite,” Cossio said. The 385-pound blue was boated after a fight lasting 43 minutes. Locally-made, Hi-5 Lures have been consistent Bisbee’s winners over the years. Angler Brad Koppen and the TK Team, fishing aboard local charter boat High Risk, brought in the other marlin on the second day. 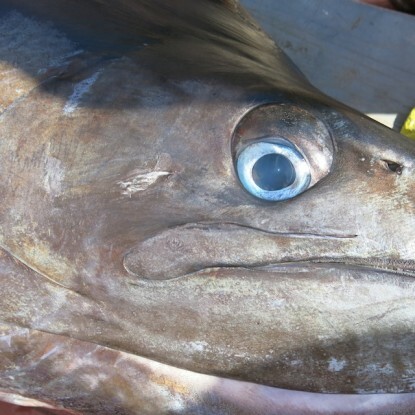 That fish, also a blue caught on a lure, failed to meet the 300-pound minimum, however. Marlin Maniacs Bob Donofrio and Craig Bicknese had an action-packed day aboard Gaviota 4. The two anglers each released two blue marlin apiece yet failed to score any points since they did not register in the Release Division. Suzuka A maintained its lead in the release standings after the second day. The Black & Blue has a reputation for drama and last-day finishes. With the final day of fishing set for Friday, that could easily prove to be the case again this year. With more than $2.1 million in prize money on the line and many of the jackpot categories still open, the first two days have been an appetizer. The main course is ready to be served.